Reports from BurnYourFuel suggests that TVS could launch TVS Apache 200 by the end of this year – 2015. As everyone knows TVS Apache is one of the best bikes in 150 to 180cc category in India and has given a tough fight against its rivals in India. Though the existing TVS Apache is sold in good numbers there are much better bikes which has made their way to the domestic market and Apache seems to get a bit old for them. Every TVS Apache enthusiast would love to have a new Apache with bigger engine that comes with updated technology. There is a good news for Apache Enthusiasts – Mr Anandakrishnan R who is the President and Director at TVS Motor Company Indonesia, has said to the Indonesian media that the next-gen TVS Apache will be heading to India in few months to come and also the ASEAN market launch could is scheduled to happen by the end of 2015. It would be great for the TVS fans if TVS Motor company brings the new TVS Apache 200 during the festive season in India which although seems to be pretty unlikely. 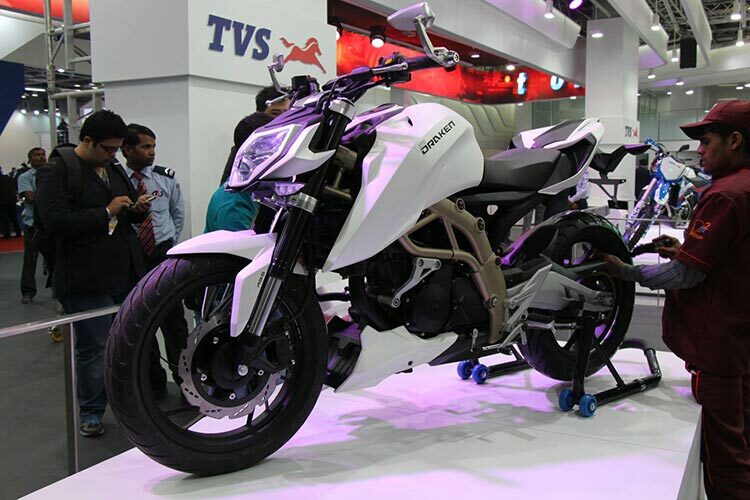 The new Apache 200 model would be highly inspired from the TVS Draken X21 concept which was showcased at the Auto Expo in 2014. The online reports states that the brand new TVS Apache 200 shall get a 200cc 1 cylinder, liquid cooled engine. The expected power figures of Apache 200cc engine is expected to be around 28 bhp of maximum power and a peak torque of 20 Newton metres. The engine of TVS Apache 200 shall be paired to a 6-speed gearbox. If the folowing version of news is true, then Apache 200 could be a serious competitors to its rivals like Bajaj Pulsar 200 NS, Bajaj Pulsar RS 200, Duke 200 and more. The other features of TVS Apache 200 which are which are expected include USD fat front forks, a rear mono suspension setup, full-digital console, bigger disc brakes. As TVS Motors is already selling an ABS model of the Apache 180 it is very likely that new TVS Apache 200 shall get at least an optional ABS model.